Notepad is a very basic, common and well known text editor. Many think that we can't do anything awesome with it as it was to old and boring. Salaam beautiful peoples! Today I will show 4 Notepad Tricks you can do and scare your friends. 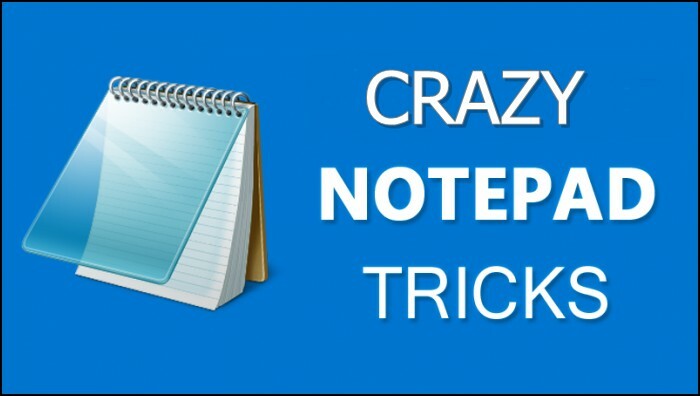 Notepad is a very basic, common and well-known text editor. Many think that we can't do anything awesome with it as it was too old and boring. First, open the Notepad by pressing "Windows Key" and letter "R" together and then type Notepad. Cope the code into the text editor. Now save the file with a YourFileName.vbs extension rather than the standard .txt extension. Now send this file to your friend and ask them to open it. Change the text in "I Tricked You" to something you want. Cope the code here into the text editor.